Heart disease is the number one killer of women in this country. Number. One. It kills more women than the next four diseases combined, including all forms of cancer. But it didn’t kill me. At age 37 and in training for a marathon, I had a heart attack. With no risk factors save a family history of high cholesterol, I thought I knew enough to stay safe. I didn’t, but you should. February is American Heart Month and I really want you to take it seriously. Not for me, because I survived and I’m healthy and thriving. But for the 500,000 other mothers, daughters, sisters, nieces, wives, lovers, and friends who will have a heart attack this year, and the 300,000 who will die from it. 8 million American women are living with heart disease; 35,000 are under 65. The biggest risk factors are high cholesterol, high blood pressure, obesity, diabetes, smoking, and family history. Women’s hearts respond better than men’s to healthy lifestyle changes. 80 percent of cardiac events could have been prevented through healthier choices. Talk to your doctor and get a lipid profile to check your cholesterol levels. Know your Body Mass Index and lose weight if you need to. Know if your blood pressure is high and take steps to improve it. Make sure your doctor knows if you have a family history of heart disease or high cholesterol. I knew that I had a family history of heart disease. I knew I had high cholesterol. I knew that women often explain away their symptoms: "I must have lifted something funny, hurt myself in yoga, maybe its heartburn," all excuses I used for days as the pain steadily grew worse for two days beforeI went to the hospital. And I knew that women's heart attacks present differently than men’s and seem somehow, inexplicably, hard for doctors to spot. I knew all that and I still never imagined this could happen to me. But it can, it could, and it did, and it could happen to you or someone you love. And now you know. 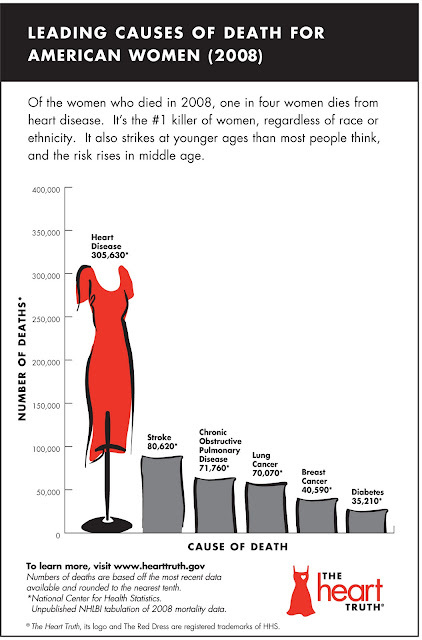 The Heart Truth is the National Heart, Lung, and Blood Institute’s women’s awareness campaign, and the original Red Dress campaign. Check it out for videos, prevention tips, warning signs, and information about how you can participate in and promote national Wear Red Day in February. www.hearttruth.gov. Sources: American Heart Association, National Institutes of Health, Women’s Heart Foundation. I'm 38. A mom of two. A distance runner. And a heart attack survivor. This blog is about life with heart disease. Read more. Contact me at jen (at) mylifeinred (dot) net. Trying to find My Life in Red? I write about more than heart disease! Read my blog Borealis, where my friend and I tackle the adventure of motherhood in the urban Midwest. THIS BLOG IS GOING PLACES!